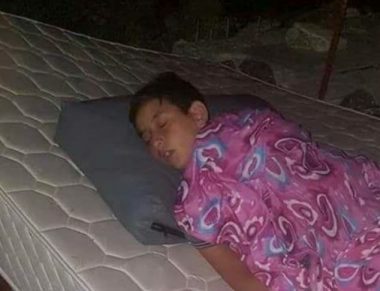 NABLUS, PALESTINOW.COM — Israeli settlers on Monday evening attacked a Palestinian home in Berkin town, north of Nablus, with bullet fire, sparking terror among the inhabitants, particularly children. Activist Ghassan Dughlas, who monitors settlement activity in the northern West Bank, said Israeli settlers targeted a home owned by the Palestinian citizen Jamal Seif with gunshots. The targeted home is located near the main access road between Nablus and Jenin. Local sources said the Israeli settlers were residents of the illegal Homesh settlement, built on Palestinian lands and supposedly evacuated some 13 years ago. Israeli Jewish Mayor of Jerusalem Nir Barkat has threatened to end work of UN Refuge Agency for Palestine Refugees (UNRWA) in the holy city, Israeli newspaper the Jerusalem Post reported. He was speaking at a conference sponsored by Channel 2 held in Jerusalem. He said he had already instructed his municipal staff to come up with a plan to replace UNRWA. UNRWA Spokesman Sami Mshasha stressing that the organsiation’s work is still continuing in Jerusalem. He said that the UNRWA offers services to thousands of Palestinian refugees in East Jerusalem, running schools, health centres and aid distribution programmes. Israeli soldiers invaded, Tuesday, Anata town northeast of occupied East Jerusalem, and demolished an inhabited Palestinian home. Media sources said dozens of soldiers, accompanied by bulldozers, surrounded Fheidat neighborhood in Anata town, and completely isolated it, before invading it. They added that the soldiers then demolished a home, owned by Saleh Fheidat, where he lived along with his family of five. 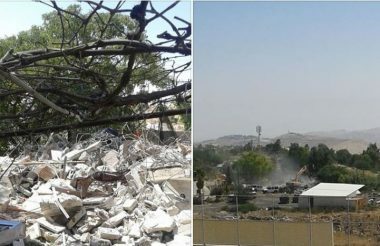 The soldiers also demolished a barn owned by Mohammad Saray’a. The Israeli army claims the demolished buildings were constructed without permits. Israeli soldiers resorted, Tuesday, to the excessive use of force against Palestinian journalists, holding a nonviolent protest near Ofer military base and prison, west of the central West Bank city of Ramallah, demanding the release of their colleague Ali Dar Ali. 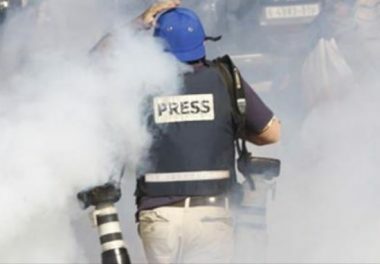 The soldiers fired gas bombs and concussion grenades at the Palestinian journalists, causing many to suffer the effects of teargas inhalation, in addition to assaulting several reporters. The nonviolent procession was organized by the Palestinian Journalists Syndicate and the Palestinian Broadcasting Corporation, and was attended by dozens of journalists, in addition to officials from the Palestinian Broadcasting Corporation, and the Palestinian Detainees’ Committee. It is worth mentioning that Ali Dar Ali was abducted by the army on August 15th, after the soldiers stormed and ransacked his home in Burham village, northwest of Ramallah. His abduction was part of repeated Israeli violations against the media and journalists in occupied Palestine, especially since the soldiers carried out 31 violations in July alone. He added that the families of the demolished homes are now living in tents, and received some basic aid to survive until a solution is found to ease their plights. A candidate for the next head of Israel’s military declared yesterday that the political divisions amongst Palestinians is a significant advantage for Israel, reported Arutz Sheva. Former deputy Chief of Staff Major General Yair Golan made the remarks at a conference of the International Institute for Counter-Terrorism in Herzliya. Addressing the “challenge” posed by the Palestinians, Golan told the audience: “Our strength is in their lack of unity”, adding that the “lack of unity” also makes it “difficult to reach a stable and long-term agreement”. The Palestinian political system is “quickly deteriotating” as a result of the Palestinian Authority’s authoritarian regime which “only serves the interests of its leaders”, a senior member of the Democratic Front for the Liberation of Palestine (DFLP) said yesterday. The Palestinian leader said that lifting the Israeli siege imposed on the Gaza Strip and ending the internal Palestinian division “must be” among the conditions for agreeing a truce with the Israeli occupation, warning of an Israeli plan to separate the Gaza Strip from the occupied West Bank and Jerusalem. He also said that it is “impossible” for the PLO to stick to the Oslo Agreement and face the “deal of the century” at the same time. Hawatmah noted that the “deal of the century” aims to make geopolitical changes in the whole region; therefore, all the Arab parties must stand up against it. More Palestinians seek Abbas’ resignation. A group of Jewish farmers living in Israeli towns bordering the Gaza Strip traveled to The Hague in the Netherlands on Monday to file a complaint with the International Criminal Court (ICC) against the “Hamas” leadership. They demanded “Hamas” to pay financial compensation over the torching of thousands of acres of farmland in recent months from incendiary kites and balloons. A delegation of about 20 farmers arrived in The Hague to hand over the drafted complaint to the court. Members of the delegation confirmed that they were speaking on behalf of about 50,000 farmers, whose products and fields had been damaged by fires over the past five months. The lawsuit was filed against “Hamas” officials, including its leader Ismail Haniyeh, his deputy Saleh al-Arouri, the movement’s former chief, Khaled Meshaal, its head in the Gaza Strip, Yahya al-Sinwar, and several others. Along with the complaint, the group protested on Monday outside ICC offices accompanied by a photo exhibit of fields destroyed by the incendiary kites and damage done by mortars and rockets. This is the first lawsuit of its kind submitted to the ICC from the Israeli side. According to the plaintiffs, the firing of incendiary kites and balloons towards the settlement areas in the outskirts of the enclave led to burning around 30,000 dunums of cultivated land, causing millions of dollars of damage as well as health and psychological damage. “What they are trying to do is to burn us, not just our fields. It’s a war crime and a crime against humanity,” farmer Ofer Lieberman said ahead of his arrival at The Hague. “The lawsuit was prepared in the light of several violations of the Rome Statute, including burning fields by incendiary kites, attacking Israeli borders, using children for combat purposes and civilians as human shields,” Lieberman added. A secret plan to move the British embassy from Tel Aviv to Jerusalem is in place according to former UK diplomat Craig Murray. Citing an unnamed source, Murray said that the Foreign and Commonwealth Office (FCO) has carried out “secret contingency planning for a post Brexit move to Jerusalem”. The plan has not been announced because of its controversy but it is thought that it may be implemented if the UK decides to leave the European Union. Murray explained that the UK is bound by a common position under EU common foreign policy so until Brexit the official line is that the UK is not considering moving its Embassy. Reasons for wanting the move is said to be “partly ideological, and partly to sweeten relationships with the USA in seeking a trade deal”. Murray revealed that information regarding the secret plan came to him via an unknown FCO source. Unable to guarantee the full reliability of the source, Murray said he had contacted the FCO Press Department to confirm the story. In his email to the FCO, Murray informed its media staff that he was asking a specific question regarding any preliminary study that may have been conducted or is being conducted, while pointing out that a generic response to his query such as “there are no plans to move the embassy” would be insufficient as an answer. MEMO contacted the FCO also asking specifically if the UK had conducted or is conducting a post-Brexit contingency plan to move the embassy and was told that the “the British Embassy to Israel is based in Tel Aviv and we have no plans to move it”.